Lindsey Vonn poses during the medal ceremony for the women's downhill race at the alpine ski World Championships in Are, Sweden, on Feb.10, 2019. 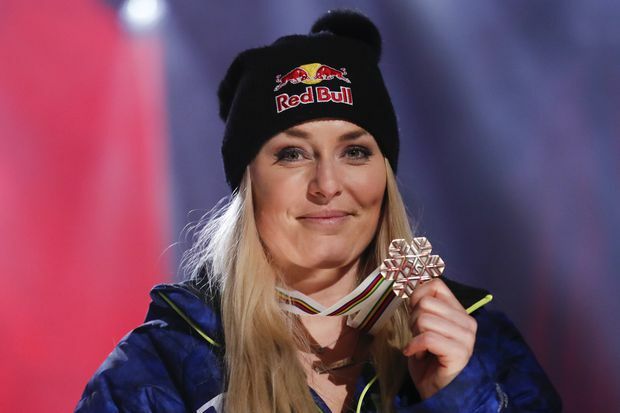 Lindsey Vonn walked away with her career haul of medals in her right hand, the gold, silver and bronze clinking together almost weighing her down. Five days after crashing in super-G — a fall that knocked the wind out of her and left her with a black eye and a bruised rib — and three months after tearing a ligament in her left knee, Vonn won the bronze medal in the world championship downhill on Sunday in the final race of her career. Vonn had been planning on retiring in December but she recently moved up her plans because of persistent pain in both of her surgically repaired knees. Then came the super-G crash when she straddled a gate in mid-air, flew face first down the mountain and slammed into the safety nets. It’s a medal that brings Vonn full circle: the American’s two silvers at the 2007 worlds on the same course in Are, Sweden, were the first two major championship medals of her career. As soon as she exited the finish area, Vonn embraced Swedish-great Ingemar Stenmark, the only skier to win more World Cup races than she did — 86 to 82. Ilka Stuhec of Slovenia beat Vonn and took gold, defending her title from the 2017 worlds. Stuhec finished 0.23 seconds ahead of silver medallist Corinne Suter of Switzerland and 0.49 ahead of Vonn. Canada’s Roni Remme finished 28th.